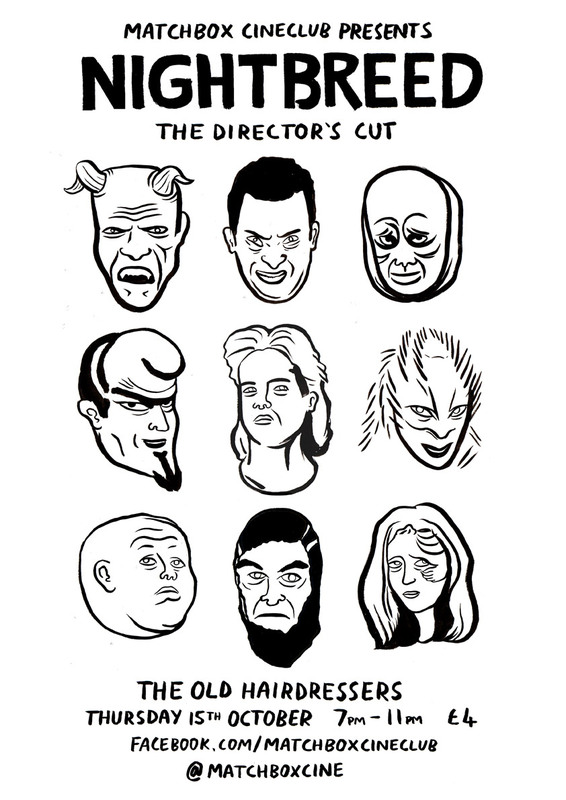 Matchbox Cineclub‘s October screening is the director’s cut of Cliver Barker’s Nightbreed (1990). Nightbreed was intended to be the Star Wars of horror movies. Directed by Barker (Hellraiser) from his novel Cabal, it’s a creature feature where the many, many monsters are the good guys, holed up in an enclave called Midian, under threat by fascistic cops and the machinations of a creepy psychotherapist played by David Cronenberg. The film was butchered by studio interference and much of Barker’s work left on the cutting room floor, where it languised for two decades. Nurtured and restored by the devotion of fans, an epic 159-minute cut was assembled from a VHS copy of an original workprint and other cut footage, then a 155-minute one dubbed the Cabal Cut, before original materials were found and Barker himself was able to recut his opus as originally intended, into this shorter Director’s Cut. Nightbreed is an orgiastic celebration of monstrous design and special effects, all lifted by a classic soundtrack from Danny Elfman, fresh from writing his seminal Batman score. The screening takes place from 7pm on Thurday 15th October in the gallery area of The Old Hairdressers, Glasgow. Admission is £4 via Eventbrite. This month’s screening is by arrangement with Park Circus Films. Keep up-to-date via the event’s Facebook page here. This entry was posted in Glasgow, Matchbox Cineclub, Preview and tagged 1990, 2015, Clive Barker, Danny Elfman, David Cronenberg, Erin McGrath, Halloween, Horror, Matchbox Cineclub, Nightbreed, NIghtbreed: The Director's Cut, October, The Old Hairdressers. Bookmark the permalink.